Friendship, friendship in respect of individuals, is no doubt a frivolous thing, and reading is a form of friendship. But at least it is a sincere form, and the fact that it is directed at someone who is dead, who is not there, lends something disinterested, almost moving to it. It is a form of friendship freed moreover from all that makes other forms ugly. On Reading is a charming little essay that Proust wrote as an introduction to his translation of John Ruskin's Sesame and Lilies. It is remarkable in that it sets out to cut reading down to size, but still manages to make it look so damn appealing in the process. To sum up his argument: no, books are not your intellectual life, they are at most the nudge that sets that life in motion. They are not the end of the road, they are perhaps not a part of the road at all, but only your desire to walk it. Reading doesn't give you the truth; it gives you the impulse to figure out the truth for itself. It's not a substitute for thinking and, seeing how it's really just a means to an end, one shouldn't fetishize it. I happen to agree with all of this, but, at the same time, I admit one is hard pressed not to slip into "reading is the best thing since sliced bread" mode, when faced with paragraphs like the one I quoted above. Luckily, that paragraph is wrong. If we spend the evening with these friends, it is because we genuinely want to. We often take leave of them, at least, only with regret. And once we have left them, none of those thoughts that spoil friendship: ‘What did they think of us?’ ‘Were we not tactless?’ ‘Did they like us?’ or the fear of being forgotten in favour of someone else. All these qualms of friendship expire on the threshold of the pure and peaceful form of it that is reading. There is no deference either, we laugh at what Molière has to say only just so far as we find it funny; when he bores us we are not afraid to look bored, and once we have definitely had enough of him we put him back in his place as abruptly as if he had neither genius nor celebrity. There are three problems with this concept, charming though it sounds. First of all, if a pure friendship is one where you never have to consider the impact of your actions on the other, I'm not sure I want it. (But I'm sure it would make a good premise for a dystopian piece.) Secondly, it seems to me that you can have this type of friendship with all inanimate objects, though, granted, some of these friendships might be more rewarding than others. Thirdly, and ironically, I think books themselves might not exactly fall into this category anyway. There is such a thing as reader performance anxiety (and if there isn't, this is me slapping a ™ on it). People do fear that they might not be smart enough, or sophisticated enough to get it. People do sometimes push on with unpromising books in the hopes that understanding will dawn on them at the end. This is partially socially inflicted, of course. We don't read in a vacuum. We have an idea of what others think about some books or authors, and we might fear to find ourselves disagreeing with them, especially if they're people we look up to. But there are situations in which you can tell that a book is good down to your bones, and still not get it. There are situations in which books throw you into unforeseen and unwanted existential despair. Proust thinks books as friendships are drama-free, because he thinks reading is a direct and silent dialogue between the author's thought and our own, without our egos getting in the way. But we're never free of our ego. 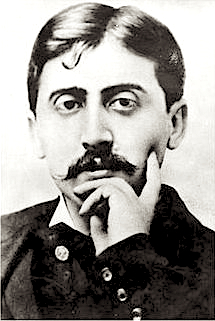 And that's why when you reject a book, you automatically reject an image of yourself as a certain type of reader (say, someone who can follow Proust's syntax or someone who gets Molière's jokes). Some of these images are harder to let go of than others. Sometimes it's hard to just put Molière back in his place .